“Breast Cancer Now is a charity that is very close to my heart and to the hearts of so many others. With so many people affected by breast cancer, including close family, my mother a survivor herself, and friends. We held our first wear it pink event in 2007 and this will be our tenth consecutive wear it pink event. Since the start we have raised £23,404.78! Our first wear it pink event to support Breast Cancer Campaign was small but well attended. We invited friends, family and business associates to our relatively small office, which we had decorated in pink, for coffee and cake. We had managed to obtain a handful of prizes, all kindly donated, and we ran a raffle to boost the funds. I think we raised around £750. The following year we moved the event to our beautiful country, pub, restaurant and B&B – The Bell, Alderminster, where the event has been held ever since, allowing more space for the fund raising activities and supporters. On average, since 2008 we raise around £3,000 per year. In the past we have wrapped the whole outside of the building in a massive pink bow (made of net and wire) and today the building is dressed in pink clothes (cut from wood and hand-painted)! wear it pink at The Bell has gone from strength to strength and over the years our fundraising activities have included stalls by local independent companies, coffee and cakes, pink photo-booth, pink champagne and cocktails, baking competition, best dressed competition, raffles, auctions, live music and entertainment and on-line challenges, to encourage and maximise donations, via social media and Just Giving. This year we have created ‘Sour Hour’ whereby the nominee has to eat a whole peeled lemon, this is filmed and posted to Facebook (which makes great viewing! ), along with the names of those that have been nominated and the link to our Just Giving page. Planning is key, obviously with the scale of the event now we have to book the date, obtain the entertainment, sponsorship, prizes and equipment. It is important to promote the event in advance – we use social media, the website, flyers, email and tell as many people as possible. We always make sure we have lots of fun! 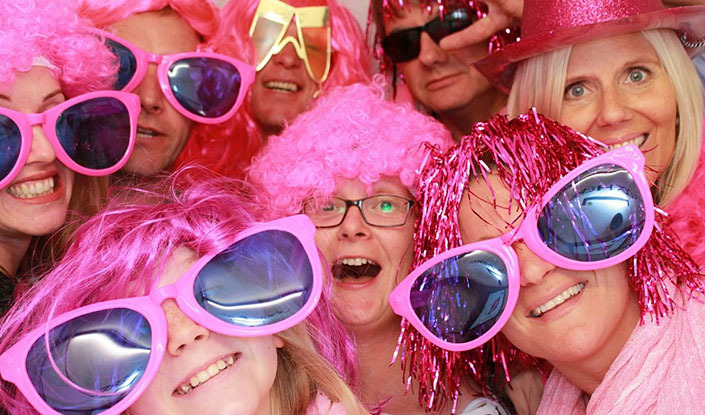 Please see a selection of photographs from our 2015 wear it pink event. Read our fundraising ideas and tips to make sure your wear it pink day is a huge success. Download our online resources to help you share your event online.